I've had this image in my head for about two weeks. It goes with the rp my good friend Jassy and I are doing, and this little scene is really sweet. My fallen angel Alesana and the two princes of hell Damien (dark hair) and Zemenix have a friendly relationship at first but grow to love one another like family. 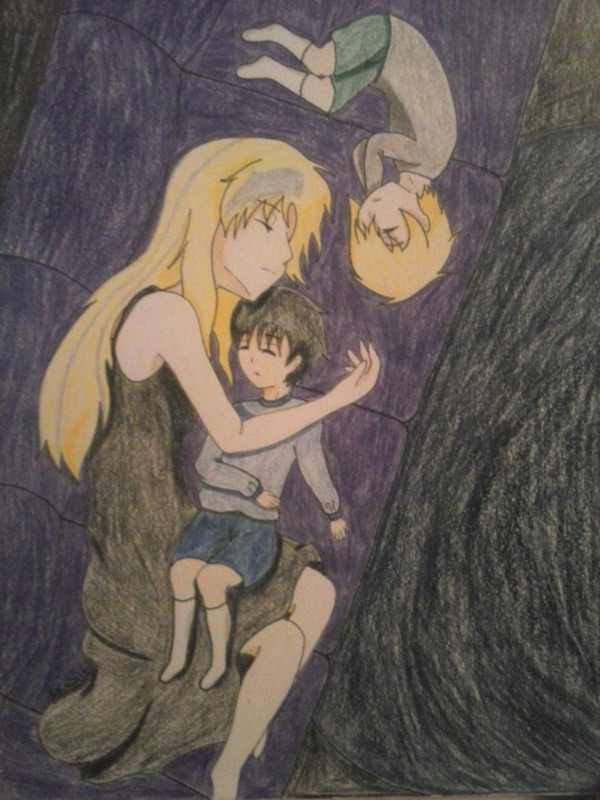 At this point in our rp, a huge bad guy has just been defeated; and Alesana comes to admit the boys her like her sons. This is the first time she calls them as such, and the first time the boys call her mom. Now that the danger is gone, the trip sit together on the couch where Alesana reads them stories. This continues until all three of the wind up falling asleep curled up beside each other. The King of Hell sees the trip asleep on his couch and can't help but take a picture.